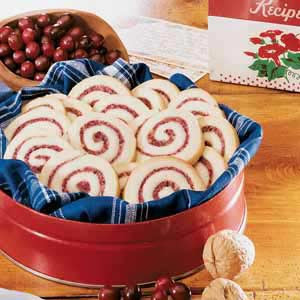 Day 9 of our 12 Days of Cookies features these Cranberry Cookies. The orange zest in them gives them a refreshing hint of citrus. They taste as beautiful as they look. Enjoy! Combine cranberries, walnuts, and orange rind; set aside.Turn dough out onto a lightly floured surface, and roll into a 10-inch square. Sprinkle with cranberry mixture, leaving a 1/2-inch border on 2 opposite sides. Roll up dough, jellyroll style, beginning at a bordered side. Roll in saran wrap and freeze 8 hours.Preheat oven to 375 degrees. Cut roll into 1/4-inch thick slices. Place slices on lightly greased baking sheets. Bake on top oven rack for 14 to 15 minutes, or until lightly browned. Cool on wire rack.Makes 3 dozen cookies.This recipe, and 349 others can be found in our cookbook “Rocky Mountain Lodge & Cabins Favorite Recipes” which can be purchased in our Gift Shop. Click Here to order your copy.